Manga artist Yoshito Usui of Crayon Shin-chan has passed away this September 20 to our uttermost regret, but the anime will most likely go on. TV Asahi made clear their intention of continuing the show, to the greatest relief of anime fans. According to the article above, President Hiroshi Hayakawa of TV Asahi announced today at a press conference that "The final decision will depend on the bereaved. We hope the continuation of the programme will be supported by the family." Hayakawa noted that Crayon Shin-chan is "loved by a world-wide audience and showing multilateral stretch." He added that like the long-running Sazae-san, he expects the crew to "create the programme consulting the original work". Crayon Shin-chan started airing in 1992. 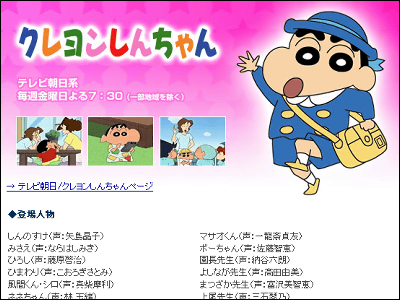 This season it's being aired on TV Asahi network from 19:30 every Friday, right after Doraemon which airs from 19:00. The competition is pretty tough on Friday nights with Fuji TV having a one-hour block for children's programme from 19:00, but Crayon Shin-chan is doing quite well, earning constant 10-12 percent viewer rate while Doraemon earns around 10 percent. Many long-running anime has been continuing after the death of original creator, including Doraemon and Sazae-san. Anime adaption of manga will eventually run out of episodes, but these long-running titles adapted the characters and settings of the original works to new stories written by screenwrites. The continuation of Crayon Shin-chan might prove it as a timeless work comparable to those.